The Beta Theta Pi Foundation awards roughly 90 tuition-based scholarships each year to Betas, and sons/daughters of Betas. Several scholarships are restricted to particular chapters/fields of study according to terms of the original endowment. Scholarships are awarded based on final scores from a three-judge panel — the higher the score, the higher the award. For more information about this year's scholarship opportunities, see below. If you have any questions about this year's Merit Scholarships, contact Beta's director of development, Laura Lednik. Details: Last year, the Beta Theta Pi Foundation awarded $104,550 in 88 tuition-based Merit Scholarships to initiated Beta undergraduates or graduate students, with awards ranging from $250 to $2,250. 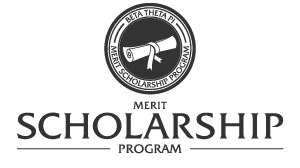 Merit Scholarship applications are evaluated by a panel of independent judges and all applicants are notified of the results in July of each year. The list of available Merit Scholarships for the 2019-20 academic year is located here. Eligibility: Undergraduate and graduate student initiated members of Beta Theta Pi who will be enrolled as full-time students in the 2019-20 academic year are eligible to apply for Merit Scholarships this fiscal year. Previous Foundation Merit Scholarships recipients are not eligible. Deadline: Applications must be submitted online by April 15 annually. Application: Online applications open February 1. Details: The Beta Theta Pi Foundation offers two scholarship funds each year that provide tuition assistance to sons or daughters of members of Beta Theta Pi. In 2019, the Seth R. and Corinne H. Brooks Memorial Scholarship will produce two scholarships ($1,325 each) and the Caroline Previdi of Sandy Hook Elementary Memorial Scholarship will produce two scholarships ($1,200 each). Eligibility: Any student who will be attending college full-time in the 2019-20 academic year (including post graduate students) and is the son or daughter of a Beta alumnus is eligible to apply. The Caroline Previdi of Sandy Hook Elementary Memorial Scholarship is restricted to individuals majoring in Education.